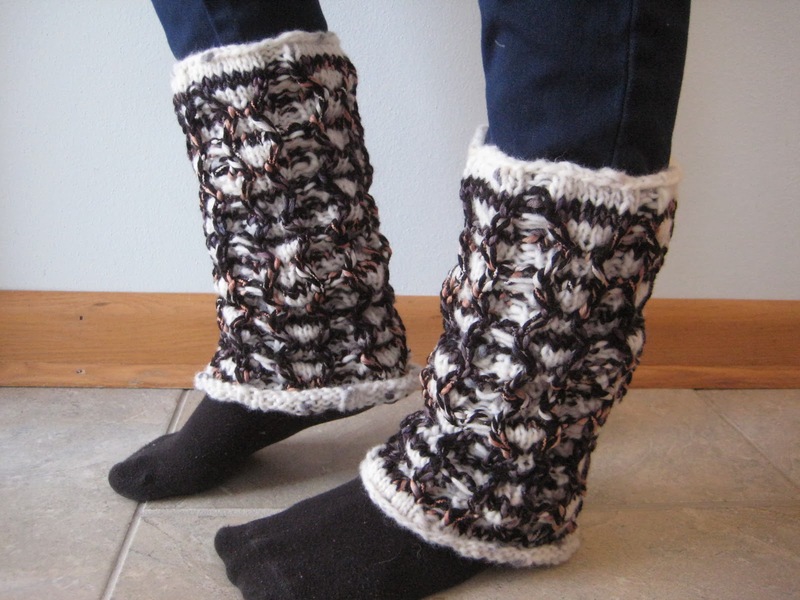 I had the idea for these leg warmers ages ago, and then got distracted by too many other projects to make them happen. Since I had already bought the yarn, however, I finally got to them this last week. And what sets these guys apart is that they actually use two different weights of yarn, as well as a number of different needle sizes, in order to create a small-to-large-to-small-again gradated look. 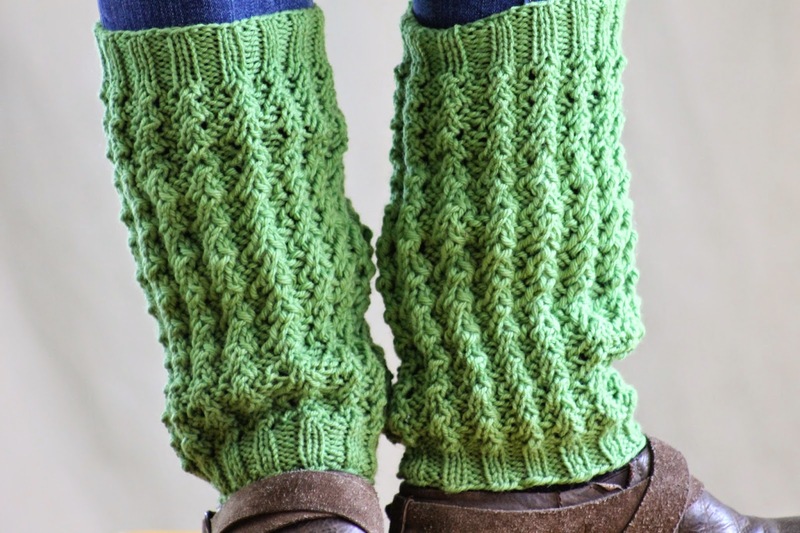 Of course, you could just as easily knit them with a single weight of yarn, with or without the needle size changes (well, you'd definitely want to change needle sizes for the ribbing, but skip the changes for everything else). This pattern is also easy to size, as long as you add or subtract a multiple of four. 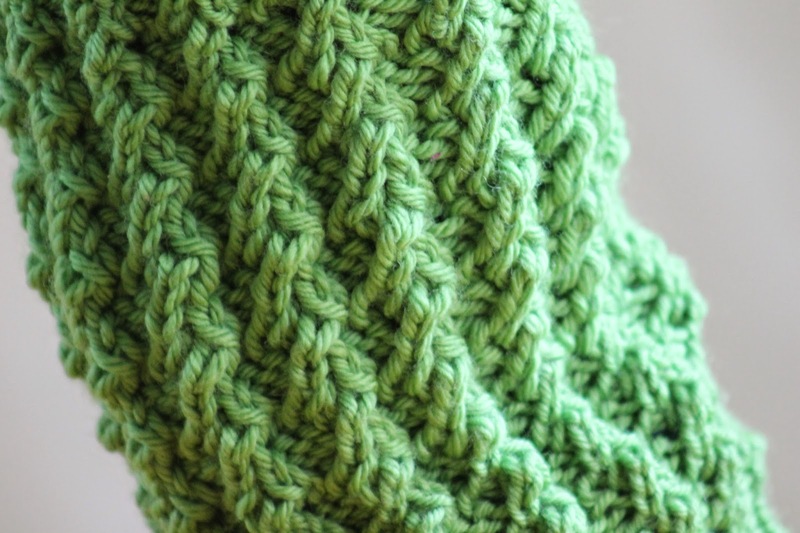 As written, the pattern is sized to be about 12" around at the top and bottom, and each four stitches added or subtracted will change the size by about 3/4". for a very deep ribbing. So I'm going to be honest, here; the main reason I knit these legwarmers in these yarns is because I had no idea what else to do with them. The accent yarn is a chunky acrylic-based variegated, which has not only a color change, but is also always two colors at any given time. And the main color yarn is mostly-white, but has occasional flecks of black. Long story short, I was worried that knitting either of them up plain would swallow the pattern. And, while I may be delusional, I think that the slipped stitch, ribbing pattern I've developed here shows off both yarns, while also creating a warm, lofty ribbing that's well suited to a legwarmer. Sizes: I recommend sizing these close to the biggest part of your calf (it's your choice whether you'd like them to turn out tighter or looser). Therefore, I will give sizing instructions for a calf of roughly 12" (14", 16"), and you can scale up or down by roughly 2" by casting on more or less stitches in sets of 9. You can also change your needle gauge for more incremental variations in size. So, in case you can't tell from the socks I'm wearing in this picture, I love me some bright colors. That's probably why I fell in love with this yarn as soon as I saw it. And besides that - well, I wanted a zig zag pattern and I thought it would be cool to change the texture of the stripes (hence the seed stitch). 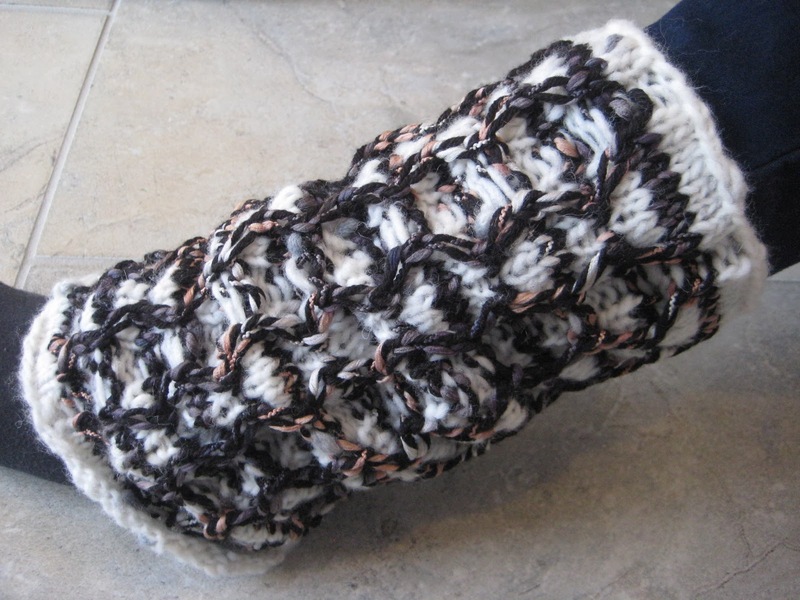 The use of the twisted stitches also adds another interesting dimension to the legwarmers, especially when scrunched up. And finally, each iteration of this pattern (the two zig zag stripes) is 12 stitches in total, which adds 2 inches to the circumference, so these legwarmers are easy to size up and down. As they're knitted, they have a 12 inch circumference and are about 11 inches top to bottom - add 12 more stitches and they'll be 14 inches around, subtract 12 and they'll be 10 and good for a child. A close-up of the pattern. So cheery!